When it comes to grocery, the rise of value brands and retailers tends to dominate the headlines. 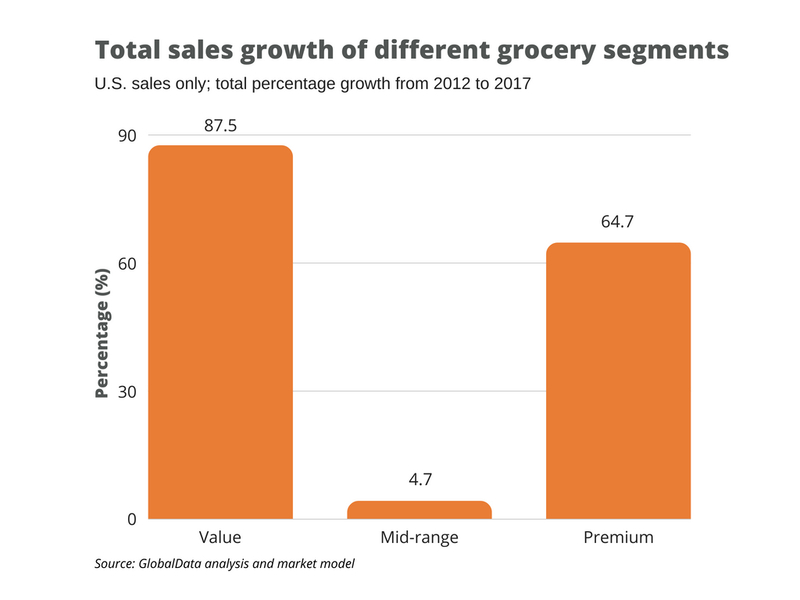 However, no less impressive is the growth of the premium end of the food market, where sales are up by 64.7% since 2012 – a figure that compares very favorably to the 18.3% rise in food sales as a whole. Growth at both the top and bottom ends of the market may seem contradictory, but it’s actually part of a trend of polarization that has consumers trading both up and down the price spectrum depending on need and occasion. Over the past ten years, this has resulted in a dramatic shift in terms of what people buy. Back in 2007, 6.3% of consumers said they shopped more or less exclusively for value; last year that figure was 14.8%. The same figures for those shopping mostly for premium were 5.7% and 9.4%, respectively. Both segments have seen a rise in shopper numbers. However, the area with the most dramatic rise is multi-level shopping, where people buy a genuine mix of cheaper and more expensive products as well as mid-market items. This group increased from 6.9% of all food shoppers in 2007 to 29.3% last year. Why do shoppers trade both up and down for grocery? As we explored in a previous article, the value side is fairly obvious: it’s about saving money, making ends meet, and leaving enough dollars for other activities and purchases. However, it turns out that even those with a frugal mindset do not always want to buy the cheapest options for all of their CPG needs. The main reason for trading up to premium is to indulge or to have a treat. Guaranteeing quality is the second reason, followed by performance, taste preferences, and purchasing for a special occasion. A lack of trust in cheaper brands and the desire to try something new follow. In other words, there are many needs that, at least in the mindset of consumers, are not necessarily fulfilled by cheaper brands. The specific nature of the reasons for trading up means that there are certain categories in which consumers are more likely to pick expensive options. 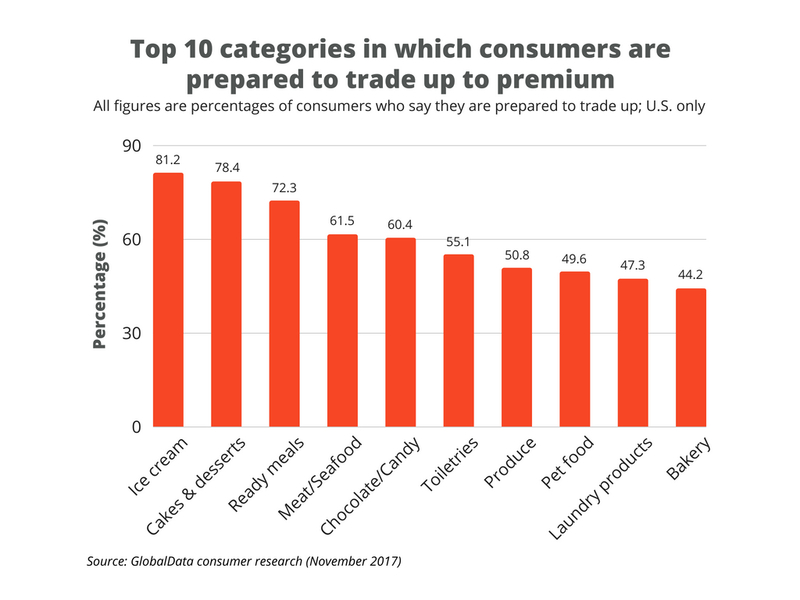 Treat-based products like ice cream and cakes and desserts lead the way, with over three-quarters of shoppers willing to trade up. Ready meals come next; here, consumers are concerned about both quality and indulgence. Meat, seafood and produce also feature, mostly because of quality concerns and a lack of trust in cheaper brands. Laundry detergent also finds its way onto the list, this time because consumers believe more expensive brands perform better. 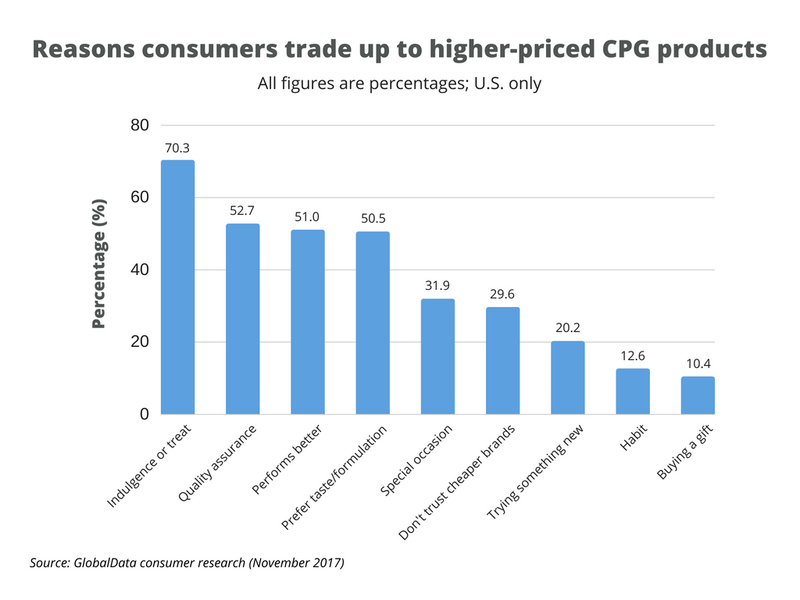 By understanding both the reasons behind premiumization and the categories to which those reasons apply, CPG firms and retailers can focus premium product and range development on the areas in which it will have the most traction. The reasons for trading up also give clues as to how premium should be expressed and explained in things like marketing materials and packaging design. Premium laundry detergent likely needs to take a scientific or technical approach to persuade shoppers of its performance benefits. Comparatively, ice cream needs to focus on pleasurable sensory attributes. At one time, premium products were the province of the big CPG firms. Their brands were trusted more than the own-brands of retailers, which were usually seen as cheaper ‘everyday’ alternatives. However, attitudes have now changed, and there is more faith in retailer-owned labels than ever before. Many shops have taken advantage of this and have developed brands to cater to premium shoppers. Albertsons, for example, launched a premium Signature range of products back in 2016. This initially spanned 4,000 items under brands such as Signature Kitchens, Signature Farms or Signature Care. The range was met with success, and in response to demand and consumer trends, the company has just launched an ultra-premium top-tier sub-brand within the range called Signature Reserve. This currently covers ice cream, but further items like tea and pasta sauces will be launched later in the year. Albertsons is not the only example. Kroger has a thriving premium business with its Private Selection brand, Publix uses the simply titled Publix Premium label, and over in the United Kingdom where private label is more developed, Tesco has the Tesco Finest brand. One of the dangers for CPG firms is that as these premium own-labels become more credible and established, they will erode market share. 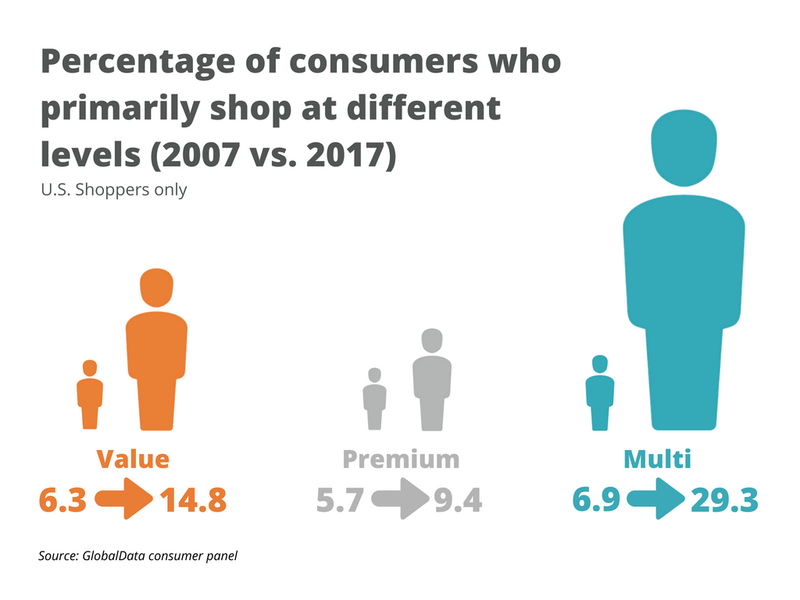 On top of this, with many niche CPG brands occupying the premium segment, some traditional CPG products run the risk of being squeezed into the low-growth middle part of the market. What should CPG brands do? What lessons can CPGs take away from the growth of premium? Here are three things to consider. In categories where consumers are likely to trade up, CPG firms either need to enhance existing products to give them a more premium edge or, preferably, they need to develop separate brands to cater to the niche. In a big category like ice cream, acquisition of smaller quality brands might be a consideration, such as Unilever’s successful buy-out of Ben & Jerry’s back in 2000. The design and presentation of more expensive products need to be assessed to ensure they resonate with the reasons people trade up. Premium chocolate is primarily about the taste, but the experience – how the packaging looks and feels, the shape and design of the chocolate bar, and so forth – are also important in creating a holistic premium experience. While the mainstream supermarkets will always represent the bulk of sales for CPG firms, even in premium, there are opportunities to partner with smaller players focused on quality. Arizona-based AJ’s Fine Foods, owned by Basha’s, is one example of a regional chain that has a very high proportion of sales in the premium brand segment. Ultimately, the trend to premium affords CPG firms a good opportunity. However, in order to access it effectively, many companies need to think less about volume and more about creating meaningful products and experiences for the consumer.